Cranbourne Shire (1868-1994), a local government area of 755 square km, was immediately south-east of Dandenong. The administrative centre, Cranbourne, was on the western side of the shire, 43 km south-east of Melbourne. The shire was predated by the Cranbourne road district (1860) extending eastwards to Tooradin. When the shire was formed in 1868 the boundary was extended further east to Dalmore. It faced the northern shoreline of Western Port Bay, from Pearcedale to Caldermeade, and contained most of the Koo Wee Rup Swamp. The sandy Cranbourne plain, however, had good grazing and agricultural land. In 1888-90 the south Gippsland railway line was built from Dandenong to Lang Lang, on an elevated track across the swamp. It provided the infrastructure and impetus for swamp drainage works, greatly extending the shire's agricultural land. An extension of the shire's boundaries eastwards in 1893 to Yannathan coincided with the programme of drainage works. The shire's boundary on Western Port Bay was lengthened to Grantville, although in 1919 it was retracted to the Lang Lang area. During 1890-1910 the shire's population nearly doubled to about 4000 people as the rich, peaty soils of the Koo Wee Rup Swamp came under dairying, potato growing and other agriculture. 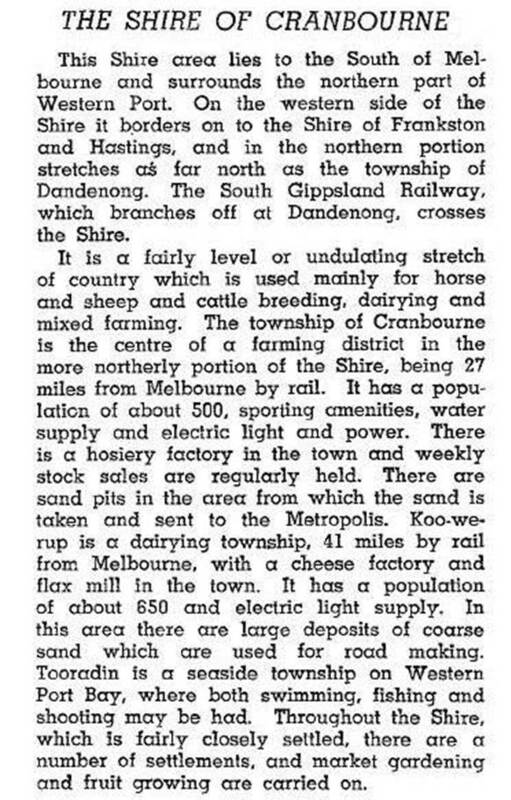 There were dairy factories at Koo Wee Rup, Lang Lang and Yannathan. A steady growth in population continued as soldier settlers and other farmers were placed on subdivided estates and former swamp lands. A railway line was built from Koo Wee Rup into the Strzelecki Ranges in 1922, tapping the milk supplies for local processing. The line began to be cut back as early as 1930 and by 1941 it went only as far as Yannathan. During the 1960s the adjoining city of Dandenong became urbanised and residential growth expanded to Hampton Park and Cranbourne township. Langwarrin, on the western edge of the shire, was on the edge of regional expansion from Frankston. Cranbourne township became the shire's main growth centre. In 1940 the township's population had been about 500 people and Koo Wee Rup's had been about 650 people. In 1991 Cranbourne had 27,000 (37% of the shire's population) and Koo Wee Rup had 1100. Cranbourne, along with Langwarrin (11,187 people) and Hampton Park (13,239) accounted for 70% of the shire's population, and a significant part of the remaining population was in smaller townships such as Tooradin or on rural/residential sites in Devon Meadows. The shire was proclaimed as Cranbourne City on 15 April 1994. When Victoria's local government boundaries were redrawn in 1994 the urbanised western sector of Cranbourne Shire was joined with most of Berwick City and part of Knox City to form Casey City. The area east of the Cardinia Creek and Tooradin was joined with Pakenham Shire and part of Sherbrooke Shire to form Cardinia Shire. Both changes occurred on 15 December. In 1994 farming occupied 52.8% of Cranbourne Shire's area. There were 35,600 meat cattle, 19,100 dairy cattle and a few thousand sheep and lambs. The potato crop was 11,000 tonnes.